Lots of guys think about a deadlift as a raw power, brute force event, with one aim and that's to pull the heaviest weight from the floor. Yes!...but they forget to train their technique. Being a weightlifter before helped me a lot with my deadlifting technique. In powerlifting, a deadlift puts lots of pressure on opponents, because that is the last lift of the three lifts (squat, bench, and deadlift). In strongman competitions this exercise illustrates real power. 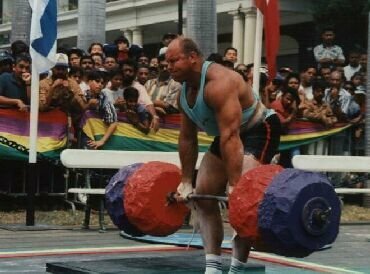 You may be able to pull a truck three seconds faster, but if I deadlift huge weight, you know there's a difference. Lots of guys don't like to train their deads because it's 'hard work' and takes a lot of energy. Before you take the bar, go through the whole motion in your mind. Feet are ±15-20 cm apart. Let your shins touch the bar before you bend down to take the bar. The bar must touch your legs at all times during the pull. Grip the bar with your whole hand, not only with your fingers. Use a reverse grip. Take a squat position before the lift, then try to squat the bar from the ground. Push with your legs before trying to lift with your back. Tense your whole body and fill your lungs. Look 5-6 meters in front of you on the floor before pulling. After you squat the first part of the deadlift, pull right throughbar against your legs all the time till you finish with the shoulders back and legs straight. During my powerlifting days and even now training for strongman, I train deadlift only once a week. The reason is that your body needs more rest after a good workout. I try to bring in rack work and stiff leg deads. Sometime cleans also help me to be more explosive. I plan my peak the last eight weeks before a competition. I plan my program back from the minimum weights that I want to do at the competition. My peak week is the 3rd to last week. You must work hard during the year so that when you start your peak, you've got a good foundation. week 7. < Rest week. Since I am doing the strongman stuff, I can't really peak like I did in powerlifting because you use different equipment in strongmanlike lifting cars and things like that. Note: The above article was originally posted on the (now defunct) World Power and Strength site.